Digital pianos might not be as expensive to purchase and maintain as acoustic pianos, but that’s not to say that they can’t get a bit pricey, with some selling for upwards of $5000. Now, we know these pianos are usually out of the reach of the average pianist. So, today, we’ve chosen to review the Top 10 best digital pianos for under $1000. Therefore, it’s unlikely that you’ll find anything for a pro player here. 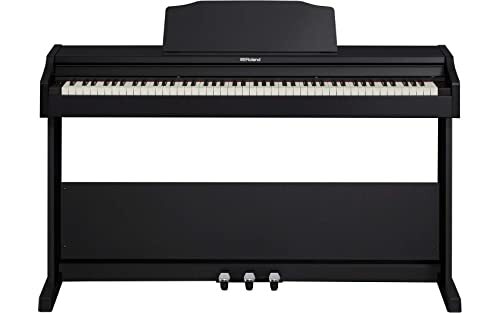 Digital pianos for under $1000 usually come with features that only beginners and intermediate players at best would enjoy. Pro players would definitely need a lot more than most of the keyboards on review today would be able to give them. But if you’re just beginning or an intermediate level payer, then you’ll love what we have coming up. What’s the best Digital Piano for an Advanced Pianist? 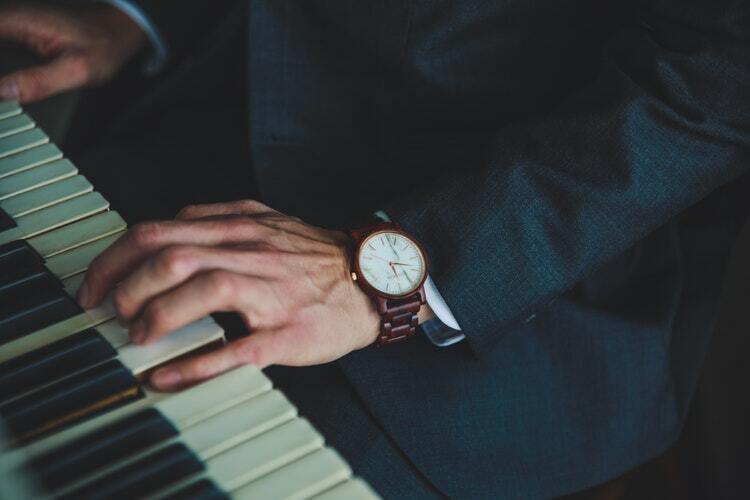 What are the Top Piano Keyboard Brands? What are the Top Headphones for Digital Piano? The Casio PX870 is now the flagship piano in Casio’s Privia series. This home digital piano with its one of a kind cabinetry packs in a lot of features for sure. However, we will only recommend this to you if you’re in need of something that’s strictly a piano. That is, you’re not thinking of using this to create music. If this is your case, then read on, we think you’ll be impressed by the PX870. 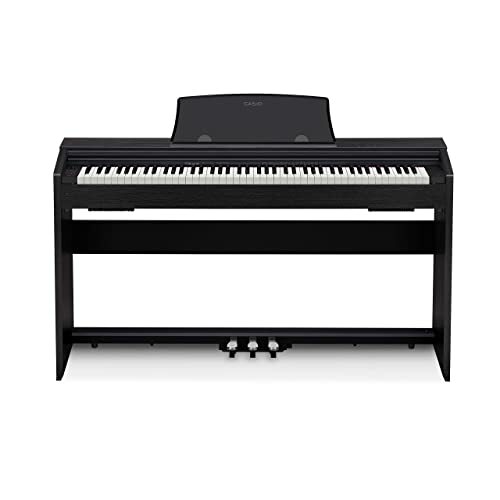 As you can see, the PX870 is a furniture-style piano, so it’s not designed to move around. This is something you want to put in a dedicated spot in your house and add some character to your space. In fact, it weighs 75 pounds and about 100 pounds with all the parts in the box. So you’re going to need some help putting this together. The interface is pretty simple with just eight buttons that make navigation easy and intuitive. There’s no LCD display, though, which is a shame. But anyway, the sound is impressive which is far more important. Plus, with the excellent Multi-dimensional Morphing AiR Sound Source sound engine, we can see why the sounds produced are so good. As mentioned earlier, this is strictly for playing and nothing else. So, it doesn’t come with many built-in tones – 19 in total. However, these tones sound authentic and the high quality sound effects dress them up nicely. Compact design with elegant cabinetry. 3-pedal unit included with half-pedal function. Not many tones or sound effects. Keys are a little noisier than you find on competitors pianos. Here’s another console model that makes an excellent home piano. Although much larger than the average digital piano thanks to its cabinet, this is still quite compact when considering home pianos. So, it won’t entirely consume all the space in your house. But, one thing you should know about Yamaha and its Arius pianos, is that they don’t come with a large number of voices or sound effects. What you have here is bare-bones at best. So, if that’s a big deal, then you’ll have to move on to other keyboards in this review because this will disappoint you. Now, let’s move on to the layout of this piano. We won’t exactly call this user-friendly. Of course, eventually, you’ll be able to find your way around without consulting your manual continually. But at first, you’ll always need it by your side. 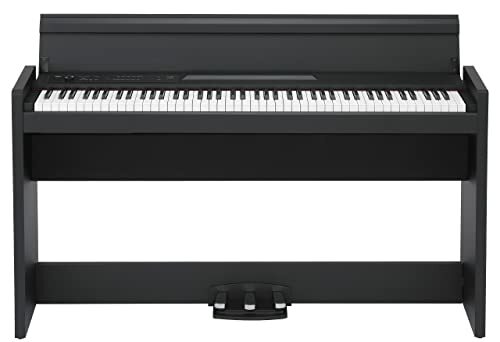 Yamaha uses its Graded Hammer Standard (GHS) keyboard which gives enough resistance, with the lower keys offering more weight than the higher keys. Plus, they are touch sensitive. So, they should give an excellent response when you play. As usual, when it comes to sound, Yamaha does not disappoint. The Pure CF sound engine we find on the YDP 143R is an amazing technology that reproduces sound like few others can. And, to make an already beautiful story more beautiful, there’s a Stereophonic Optimizer on the YDP 143R. This is a feature that gives you a natural, spacious, and immersive experience when listening to yourself play through headphones. Finally, the R in the YDP 143R stands for Dark Rosewood which is the finish this piano comes in. But, there’s also a Black Walnut finish if you prefer. Piano sounds are rich and natural. Lesson program for beginners included. Only few built-in tones and no rhythms at all. 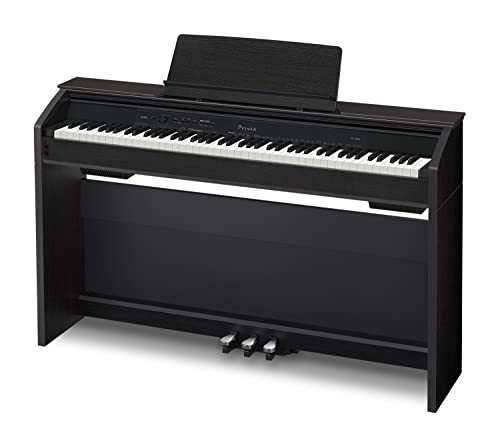 The Roland RP102 is Roland’s most affordable console piano. The brand sure packed some amazing technology into this thing. It’s definitely one of our favorite digital pianos, and here are a few of its many features. 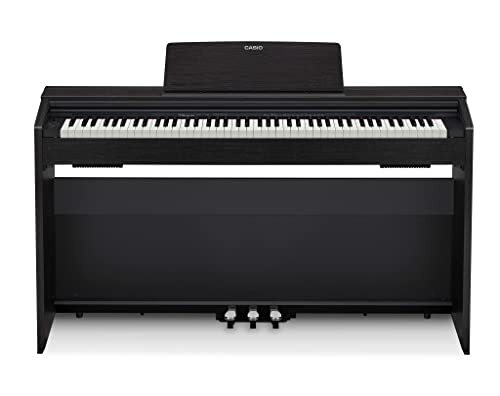 Comparing the RP102 to the other digital pianos we have reviewed so far, even though they are all console pianos, the RP102 has a more traditional appeal than the others. Now, because the others have a more contemporary appeal, they take up less space. On the other hand, traditional style cabinets look more like acoustic pianos and therefore take up more space. The keyboard on the Roland RP102 is very realistic. But we didn’t expect anything less from the brand. Plus, the keyboard also comes with a graded action which makes this feel somewhat like an acoustic piano. And let’s not forget the tri-sensors which give this keyboard an excellent response. As always the sound technology on this Roland digital piano is excellent. And you won’t find any modeled sounds, just high-quality samples. The Roland RP102 comes with a black finish that gives it a sophisticated look. There are no other color options available, but that’s not really necessary since most people prefer black anyway. The controls are also quite straightforward and Roland keeps the interface clean, simple and easy to on the eyes. But the downside is that, with only 4 buttons, it becomes a bit difficult for users to quickly access the sounds and other functions of the keyboard. Traditional style cabinet with a strong resemblance to an acoustic piano. Fantastic action with simulated ivory keytops. Comes with four authentic grand piano tones plus effects such as string and key off resonance. Features Roland’s excellent sound engine: SuperNatural sound technology. This keyboard isn’t exactly easy to navigate without the App. Many of the features are only accessible through the App. While the Korg LP380 may not be the best thing since sliced bread, it’s definitely a very dependable instrument that you can count on. It might not come with all the extras that other keyboards might have, but nonetheless, it does have a lot of fans. The Korg LP380 looks good, with a sleek and very modern design. So, it will easily fit into any living space. Of course, it isn’t exactly a portable unit, but that is to be expected. Now, how does it sound? The Korg LP380 comes with an impressive sound that’s rich and carries a lot of presence. The problem is that the speakers are not that good, neither are the sound effects. But when used with headphones or through an external amplifier, you won’t be able to deny the beauty of the LP380’s sound. Furthermore, the LP380 comes with a great keyboard with a hammer action. This gives the keyboard a feel that closely resembles that of an acoustic piano. Plus the action is graded which also adds to the realistic feel. Now, of all the pianos we have reviewed so far, this is the piano with the largest number of instrument voices – 30 to be precise. And being well organized, you’ll find it very easy accessing them using the control panel. And because they are diverse, you’ll thoroughly enjoy the inspiration they give you, to create some great music. Comes in a really sleek design. Sound quality is excellent especially at this price point. Not many sound effects to play with. Not great for live performances. 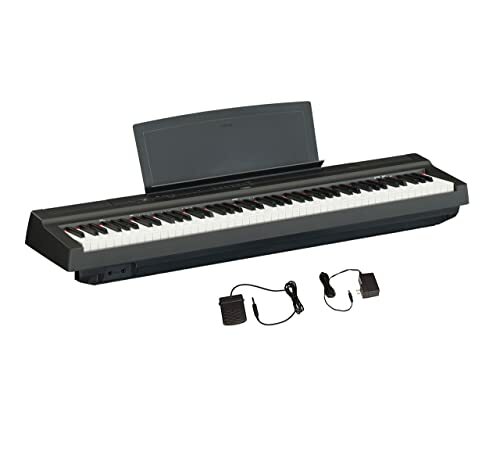 The Yamaha P45 is an affordable entry-level keyboard Yamaha specially made with the beginner in mind. It’s compact and lightweight. So, you’ll find this piano quite easy to move around. Now the controls on the P45 are straightforward and easy to navigate. And this is important because it is aimed at beginners, who don’t want to be overwhelmed with loads of confusing buttons early on. The keys on the P45 are also nice enough. They might not give you the ultimate realistic playing experience. But they are fine for an entry-level keyboard. It also features a hammer action that’s graded. The keys come with a matte finish, which is great for when your hands get sweaty from extended rehearsals, they won’t slip off like on glossy keys. The AWM Sampling technology on the Yamaha P45 is excellent and does a good job reproducing the in-built sounds. Nevertheless, this is not the instrument you’re looking for if you need loads of sounds and effects. But then again, as a beginner, this might not be such a deal breaker just yet. Compact and lightweight design which makes it portable. The sounds are few but very realistic. This is a fantastic entry-level keyboard. Does not come with recording and playback functions. Sustain pedal feels low quality. This is perhaps the most versatile piano we have on review today. It’s like a synth and a digital piano in one instrument. So, it comes with features that make this piano great for playing and for making music. So, for those who have been looking for loads of sounds, as well as masses of sound effects, rhythms, and styles, you just hit the jackpot. The DGX-660 could be the perfect keyboard for you. And it doesn’t even cost that much. At least compared to a number of the keyboards we have seen so far. For the features this offers, it is very affordable. Now, considering all the features included, you can expect the control panel to be a hodgepodge of different settings. However, the control panel is, in no way cluttered. Accessing all the functions and voices is easy. Plus, it also comes with an LCD screen which makes interaction with this keyboard a lot easier. We could say that the keys of the DGX-660 are its greatest drawbacks, but it’s not such a big deal. They feel great, except for the fact that they are finished in matte, rather than simulated ivory and ebony. It’s not so bad, but it would have given this keyboard a much better feel if they had been. Moving on, Yamaha uses its Pure CF sound engine on the DGX-660, and if you’ve heard it before, you know how amazing it is. It sounds very convincing and rich. And, as mentioned, earlier, if you’ve been looking for a keyboard that comes with loads of sounds, this is it. The DGX-660 comes with 554 sounds! Plus over 100 sound effects you have at your finger tips as well. Massive library of sounds, rhythms, sound effects, and styles. Can record both audio and MIDI. Comes with a sturdy piano stand. Lesson program to help beginners practice. Sustain pedal appear to be a little low quality. Here’s our second Casio piano on review. However, this is meant more for a beginner because of its compact size, portability and it doesn’t come with a cabinet. Being an entry-level keyboard, this is quite affordable. So, it’s within easy reach for most beginning pianists. And being compact, you’ll be able to place this just about anywhere without any issues. It does feel pretty fragile though, so if you intend to move this around, you’ll need to be careful. We’d advise you to get a gig bag so that it protects your keyboard from any accidental hard knocks that could damage the frame. We love how Casio keeps the interface and control panel of the PX-160 so intuitive and straightforward. You’ll have no trouble at all easily accessing the main functions. But as for other functions, you’ll have to study the manual a bit and get used to the keyboard before getting the hang of them. Now the keyboard on the PX-160 is terrific, especially for an entry-level model. The action is great, the keys are sensitive and feel really good. They even come with simulated ivory/ebony keytops which isn’t something you readily find on most beginner keyboards. Finally, thanks to the Multi-Dimensional Morphing AiR Sound Source, this keyboard sounds superb. You’ll find that it reproduces all of its 18 built-in sounds beautifully. Simulated ivory/ebony keytops with Tri-sensor Hammer Action II make the keys feel great. Compact and lightweight making it portable. Speakers are of a decent quality. Keys are a bit squeaky. And yet another Casio in our review, but this time, the Casio PX770. It’s basically the older model to the PX870 which was the first product we reviewed. 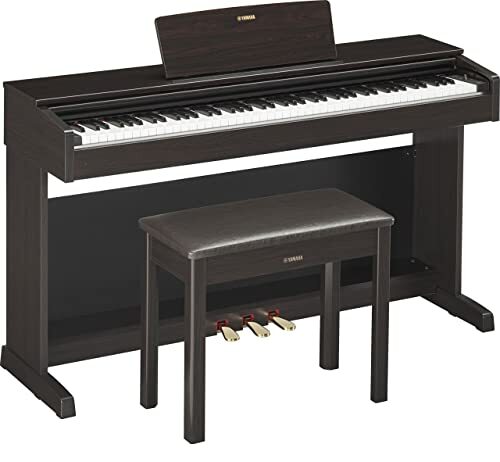 It’s a moderately priced furniture style piano with a package that gives you everything you need. In the package, you’ll find a bench, a stand, as well as three pedals (which, of course, support half-pedaling). Looks wise, this easily fits into your home décor as a family piano. But even more important than the looks, this is a piano that plays well. There aren’t many tones included, the total number being 18. But they sound good. And when you combine the sound quality with the excellent speakers and fantastic keyboard, you easily see why the PX770 made it into our review today. Furthermore, the keyboard on the PX770 comes with 88 keys, and the action is great. Plus, with the simulated ivory and ebony keytops, you’ll definitely enjoy playing this piano. We love the sound of this keyboard. It’s rich and beautiful and makes this a piano for the whole family to enjoy. Keys come with a great action and simulated ivory and ebony keytops. Not many features to intrigue the intermediate player. It’s a bit difficult to assemble. And as we draw closer to the end of our review, we examine the Casio PX860. It’s moderately priced, but we can assure you, that you get what you pay for. 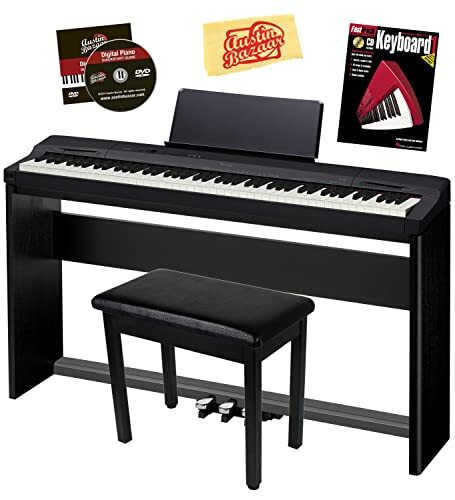 This is a great home piano that looks good, feels great, and delivers on performance. The keyboard performs similarly to a classical piano. And with the tri-sensors, you’ll love how sensitive these keys will feel when you get your fingers on them. So, from the subtlest strokes to the fiercest strikes, the keys will pick up every tiny nuance. As for looks, with its cabinet, this looks just like an acoustic piano. However, it comes in the contemporary style rather than the more traditional feel of the RP102. With a max polyphony of 256 notes and an excellent sound engine – the Multi-Dimensional Morphing Air – the sound of this keyboard is nearly unbeatable. As usual, with most console pianos, the built-in voices are quite limited. And that’s the same story here. There are only 18 tones so it might not be sufficient for the intermediate player, but for a beginner, it should be fine. Finally, Casio stands behind this piano with a whooping 3 year warranty. So, this should boost your confidence in the Casio PX860 even more. Comes in a design that closely resembles a classical piano. Great keyboard with fantastic action and ivory/ebony keytops. Low number of voices and sound effects. What better way to end this review than with a Yamaha, the P125. 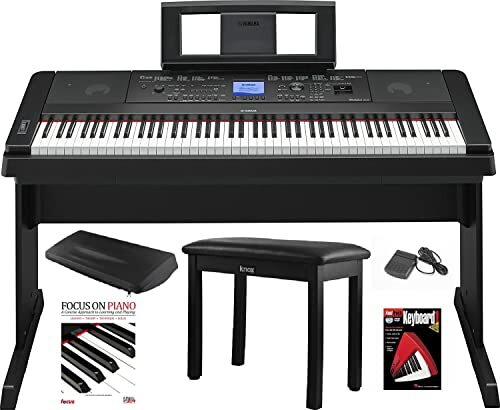 Yamaha has always made some of the best digital pianos, at the best possible prices. And the Yamaha P125 is another portable model with 88 keys. Yamaha uses the Graded Hammer Standard action on the P125, which is the companies most affordable hammer action. It gives the keyboard a decent feel with enough resistance to make you almost feel like you’re handling an acoustic piano. So, whenever its time to make that transition to an acoustic, it’s going to be totally seamless. The Pure CF sound engine is terrific. 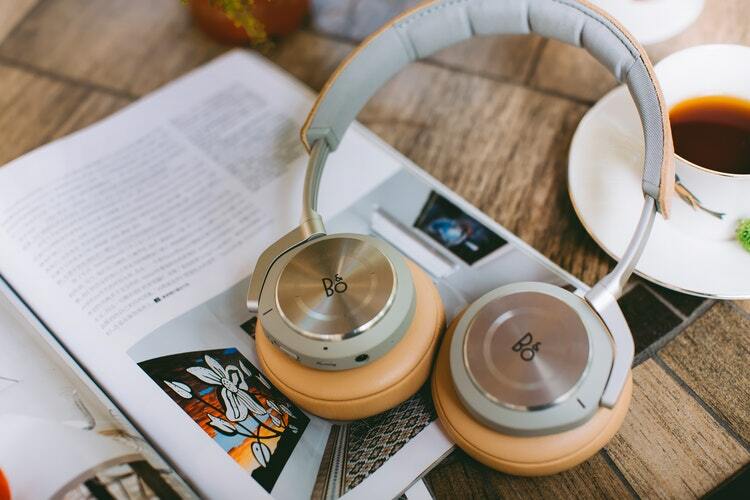 We love the way it delivers such a powerful sound that’s rich and beautiful. And there are also quite a number of functions and features that could help you play around with the voices on the P125. 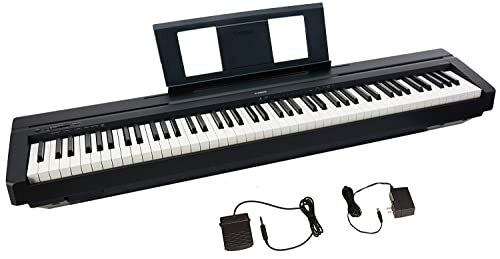 Finally, with the USB connectivity, this piano allows you connect to any DAW. So, you can easily transfer your audio and MIDI files in and out of your keyboard. This does not come with a stand. If we are to pick just one piano as the best for an advanced pianist, then the choice is easy. We’ve got to go with the Yamaha DGX-660. The advanced player will enjoy the versatility that the DGX-660 offers because they’ll be getting the best of both worlds – a synth and a digital piano. It’s not a home piano, but it’s a serious piano for the serious musician. There’s no other keyboard like it in our review. And, considering it comes at such an affordable price with so many features, it definitely has a soft spot in our heart. It’s easy to see from our reviews who the giants of the digital piano industry are. Namely, Yamaha, Casio, Korg, and Roland. These brands have been making high-quality pianos with fantastic performance features for decades. 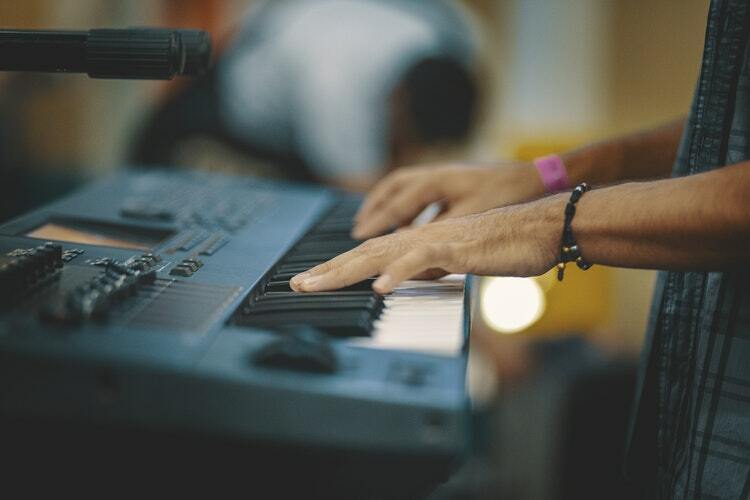 We love the fact that they carry various kinds of digital pianos for different types of piano players. And regardless the level of the piano, we respect how these brands pour their all into making each of their keyboards as good as it possibly can be. So, whatever the price point, you can always trust any of these brands keyboards to present fantastic sounds and features. We went looking for the best headphones for digital pianos, and we saw two nice ones that we think you should check out. First, there’s the Yamaha RH1C Portable Headphones. They are a decent quality headphone from market giants, Yamaha, and are very competitively priced. And players who have used these headphones testify that they are totally immersive. They sound fantastic used with anything, but especially with a digital piano. Another good option is the Tascam TH-03 Studio Headphones. They are also a great choice but are bit higher end than the Yamaha RH1C. They come with a noise isolation technology which makes them perfect for audiophiles. They are also comfortable and look good. It simply isn’t true that you need to spend a fortune to get a good quality piano. You have now seen our affordable choice of the Top 10 best digital pianos for under $1000. And each of them sounds and plays well and has its advantages which appeal to different kinds of players. In terms of recommendations, we have already gone for the Yamaha DGX-660 for the intermediate player. And now for the beginner, we would recommend the Yamaha P45. It’s super affordable and comes with a lot of the features that beginners need to begin their musical journey. So, have you listed your priorities yet? If so, it’s now time to make your decision as well.